In addition to the three overall winning teams, the SP Cup 2016 judging committee is pleased to announce the following special recognitions and honorable mentions. 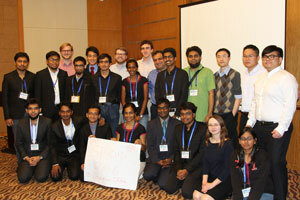 All undergraduate participants are sophomores (2nd year); the team made for Top Ten. Congratulations to the winners and honorable mention teams on their excellent performances! Thanks all participants for making SP Cup 2016 successful! Special Acknowledgement of Mathworks, Inc. for their strong support of SP Cup 2016 and every SP Cup to date since its inception. Stay tuned for an article highlighting SP Cup 2016 in the IEEE Signal Processing Magazine. And the SP Cup 2017 will be announced in the 2nd half of this year. The IEEE Signal Processing Society (SPS) invites you to participate in the Third Annual International Signal Processing Cup (SP Cup) Competition. The SP Cup aims to provide undergraduate students with opportunities to form teams and work together to solve a challenging and interesting realworld problem using signal processing techniques. The 2016 SP Cup will be held in March 2016 at the 2016 IEEE International Conference on Acoustics, Speech and Signal Processing (ICASSP, www.icassp2016.org/) in Shanghai, China. Three top teams from the preliminary round held before the conference will be selected and invited to present their work at ICASSP 2016, where prizes will be awarded. All undergraduate students are encouraged to participate. Please feel free to distribute this email to students, friends, and colleagues who may be interested in this competition. MathWorks is pleased to sponsor the 2016 SP Cup. MathWorks will provide complimentary software, including MATLAB and selected toolboxes, to teams registered for the SP Cup for use in the competition. Technical questions: please create an account and post your questions through the Q&A tool on the Piazza website (either as a public inquiry to the SP Cup 2016 community or a private message to the organizers). https://piazza.com/ieee_sps/other/sp1601/home, using access code "sp1603" to enroll. The organization of 2016 SP Cup Competition is led by members of the IEEE Information Forensics and Security Technical Committee (IFSTC), and overseen by the IEEE SPS Student Services Committee.